Spring has finally arrived. Buds are bursting, flowers are blooming, and pollen is everywhere—which means lots of sneezing and allergies. It also means lots of migrating birds. I was out with my bird club this weekend and saw over 50 species. I even got some gardening done, and have a few aches and pains to prove it. Daughter of Deep Silence by Carrie Ryan from Penguin. Freedom’s Child by Jax Miller from Random House. Second Life by S.J. Watson from Harper. Love May Fail by Matthew Quick from Harper. Love May Fail is a story of the great highs and lows of existence: the heartache and daring choices it takes to become the person you know (deep down) you are meant to be. How Business Works by DK Publishing from AmazonVine. Wow, I bet the bird watching was loads of fun! Love May Fail sounds like it will be a bit heartwrenching! Sounds like you had a great weekend! All of your titles are new to me. Enjoy! I got 3 of the same books! I got Love May Fail but I want Second Life too! Enjoy! 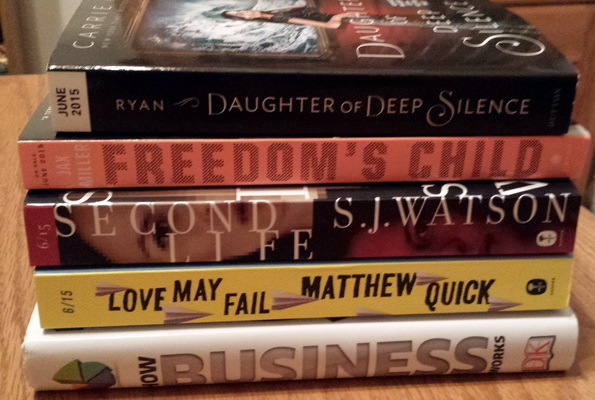 Yay for the new Matthew Quick! Daughter of Deep Silence caught my eye too. Enjoy and have a great week! I love going bird watching, but I don’t get to do it very often. Enjoy your books! Second Life looks good to me. I received Freedom’s Child too. 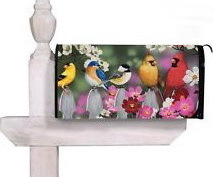 Sorry I didn’t comment before on your adorable mailbox of birds and flowers – so pretty! All of your books sound intriguing. I hope you enjoy them and are had a good week. Looks nice! I also have a copy of Love May Fail. I read the author’s previous book and loved it. I think all of those look great…at-chooo!